What caused this calamitous event? Historians have wrestled with this for centuries. Constantinople and Rome had had less than rosy relationships for quite sometime yet existed in an acknowledged state of unity. Some have pointed to the massive cultural gap that existed between the magnificent intellectual center of the capital of the Eastern Roman Empire and Rome which had become a cultural backwater. Some point to controversies over iconoclasm and the filoque being added to the Creed by the Latins. There was severe political tension at the time as well. All of these things entered into the mix of the time. But the straw that broke the proverbial camel’s back was something modern scholars find embarrassing at best. It was the issue of bread, not any bread but the bread on the Lord’s Table. What kind of bread was to be used in the Lord’s Supper . . . leavened or unleavened. Briefly, the trouble began in 1050 when some Greek churches in southern Italy (under Byzantine control at this time) were condemned at the reforming Council of Siponto. In retaliation Michael Cerularius, Patriarch of Constantinople, ordered Latin churches closed in the imperial capital. Thereafter Leo, Archbishop of Bulgaria, wrote a letter to John of Trani to be passed on to Pope Leo, containing a stinging refutation of the azymes introduced by the Roman Church. Cardinal Humbert was drafted by the Pope to respond to Leo and finally sent to Constantinople with the sad results of 1054. Whence Comes this Strange Question? Most of us will be amazed at the charges of the Greeks. If you are like me, it never occurred to me to even question the use of unleavened bread. I have heard all of my life that, even if we somehow weasel out of the alcohol of Jesus’ wine, we must have unleavened bread! Was this accurate? How could this be? I had never heard of it and I had a Master’s degree in Church History! Did the early church, in fact, use common ordinary bread for the Table? For some unknown, psychological reason, a need was created within me to know . . . There is no doubt that the Greeks use leavened bread in communion. There is no doubt that Rome’s use of unleavened bread was the item that broke fellowship between Eastern and Western Christians in 1054. But is it true that the early church likewise used common, ordinary . . . leavened bread? In the history of this debate there have been basically three ways of going at it: 1) etymology and chronology; 2) theological symbolism especially of the Incarnation; 3) the inherited liturgical practice of the church. The Greeks, whose native tongue is Greek, insisted (and still do) that the common word for “bread” in Bible (artos) always referred to ordinary bread. They insisted (and still do) that artos was plain bread unless it was modified by the word azuma. Scholars, naturally, are divided on this subject. Most admit that the typical meaning of artos is plain common bread though that it can, on occasion, refer to unleavened bread. Louw and Nida’s Greek-English Lexicon of the NT Based on Semantic Domains states artos “is a relatively small and generally round loaf of bread . . . like a ‘rolls’ or ‘buns’). The Anchor Bible Dictionary, on the other hand, states that artos can possibly apply to unleavened bread but the only example it produces is that which is contested by the Greeks in the institution of the Supper in the Synoptic Gospels. Undisputed use of artos is Luke 14.1 where artos simply refers to “food” or to “eat” (cf. Mt. 4.4 and Mk 3.20). The use of artos in Mt 14.17, 19 the feeding of the 5000 is clearly ordinary bread. A chapter later in the feeding of the 4000 we see our term again rendered “loaves” and is ordinary food (Mt 15.36). Paul, when on a ship in a storm, took artos and blessed it . . . this is clearly ordinary bread (Acts 27.35). The Lord instructed us to pray for our daily artos (Mt. 6.11/Lk 11.11) again clearly plain bread. Examples in the LXX include Leviticus 23.17; 2 Samuel 13.8; and Ezekiel 4.12 (among literally dozens more). This will sound familiar and will probably come up in questions later today too. The Latins appealed to the institution of the Supper itself. Since Jesus was celebrating the Passover he must have used unleavened bread . . . the writers would expect the readers to know that when they encounter the term artos. You will recall that the ABD likewise appeals to this episode . . . but this is almost like circular reasoning. The Synoptics do indeed associate the Supper with the Passover (cf. Mt. 27.62; Mk. 14.12-16 and Lk 22.7-15). “But so that I might forsake all other defense, I am able now to prove in Christ – if you are good enough to listen – that when the Lord ate with his disciples on Holy Thursday, the matzo-observance was not yet in effect. For it was the high day of Preparation, which fell on the fourteenth of the month and the Hebrews were just about to celebrate Pesach.” (Letter to Dominic of Grado). For their part, matzos (azuma) were prescribed for the Hebrews in remembrance of the hasty flight from Egypt so that, remembering the wonders that God did among them, they would abide by his commandments and never forget his deeds. But the perfectly leavened (artos) – which through the ritual is made over into the remembrance of His dispensation in the flesh. 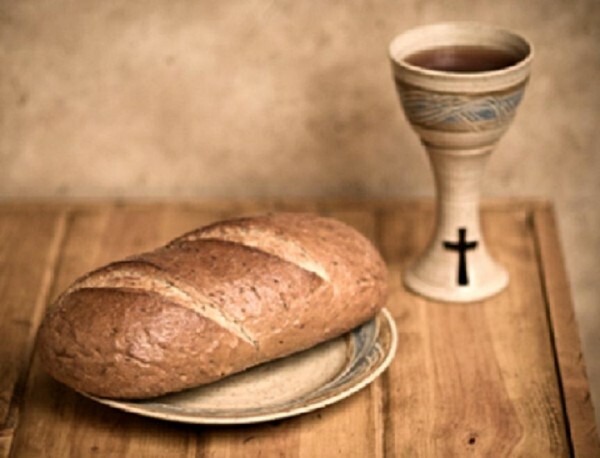 ‘For, whenever you eat of this loaf and drink this cup,’ he says ‘you proclaim the death of the Lord until he comes [1 Cor. 11.26]. . . There is much more but this gives a sense of the flavor of the discussion . . . the Greeks, whose native language is Greek(!) insist that artos means ordinary bread. They also insist that the institution was not on the Jewish Passover. They may be mostly correct on one and mostly wrong on the other. (We do recognize there is at least a conflict between John and the Synoptics on the chronology of the last days of Jesus life. I believe that John is making a theological point rather than an historical point). I will pass on the Christological symbolism appealed to in this debate for the sake of time (both Latins and Greeks make extensive use of it . . . as do we). However, we did hear some of it from Peter of Antioch above. But what about the history of the church’s worship, this is very relevant to our question? The Greeks claimed (and continue to do so) that they have preserved the true practice of the church and the Romans were innovators (recent ones at that). This is the crux of the matter for the Greeks … no one before actually used unleavened bread! “There is then brought to the president of the brethren bread (artos) and a cup of wine mixed with water; and he taking them gives praise and glory to the Father . . . and offers thanks at considerable length . . .
That sounds clear enough. There are many, many, many more examples gathered by Woolley. “And to take away the supersticion whiche any person hathe, or myghte haue In the bread and wyne, it shall suffyse that the bread bee suche as is usuall to bee Eaten at the Table with other meates, but the best and purest wheate bread Conueniently maye be gotten” (Fourth Rubric after the Commentary). One of the surprises, to me, during this journey was that at least through the 19th century the Anglican church used leavened bread during the communion. The Orthodox Church, Coptic Church, Syrian Jacobite Church, Nestorians all continue to use leavened bread in the Eucharist. It is the consensus of historical scholarship that the Christian church (East or West) did not ordinarily use unleavened bread in communion until the 9th century A.D. The only exceptions to this are the Ebionites and the Armenian Church who introduced unleavened bread in the 7th century. The Greeks were right. The received liturgical tradition was in the form of common leavened bread. The question remains, Why the change? John Erickson argues that the introduction unleavened bread to the Table parallels the rise of views of the Supper as something as other than “ordinary,” something beyond the ordinary experience of worshipers. The unleavened bread fit the mystery the mass. It was sacred and different so the bread was to be different. About this time the chalice would begun to be with held from the laity and the host was beginning to be seen in near idolatrous terms. The debate regarding “bread on the table” has been lost to the dustbins of history … and even there primarily to footnotes … unless you delve into specialized materials. Yet this debate altered the way ordinary Christians experienced the Table every week. For a thousand years the western church for the most part used plain ordinary bread in communion. I would argue that the Greeks are correct that in the NT (in Corinth) the first century church used ordinary artos as well. One truth has emerged from my study … even when we think we are simply reading the New Testament we are often imposing meanings that simply are not there rather what is there is our tradition that we do not realize is a tradition. Characterization based on Richard Mayne, “East and West in 1054,” Cambridge Historical Journal 11 (1954), 133. John H. Erickson, “Leavened and Unleavened: Some Theological Implications of the Schism of 1054,” St.Vladimer’s Theological Quarterly 14 (1970), 156. Quoted in Jarsolov Pelikan, The Spirit of Eastern Christianity (600-1700) (University of Chicago, 1974), 177. Jeff Childers, Douglas Foster, Jack Reese, The Crux of the Matter (ACU Press, 2000), 38. Quoted in Timothy Ware, Eusratios Argenti: A Study of the Greek Church under Turkish Rule (Oxford, 1964): 117. Reginald Maxwell Woolley, The Bread of the Eucharist (A.R. Mowbray, 1913), 6. Ibid, p. 19; See also Erickson, “Leavened and Unleavened,” pp. 158-159. Bede, The Ecclesiastical History of the English People (Oxford), 79. See also Woolley’s commentary on the Latin of this passage in Bede, Bread of the Eucharist, pp. 15-16. Woolley, Bread of the Eucharist, pp. 42-43. “Azymites,” New Schaff-Herzog Encyclopedia of Religious Knowledge, vol. 1, p. 389. W. B. Bartlett, An Ungodly War: The Sack of Constantinople & the Fourth Crusade (Sutton 2000). Christopher M. Bellitto, The General Councils: A History of the Twenty-One Church Councils from Nicaea to Vatican II (Paulist Press, 2002). Louis Brehier, “Attempts at Reunion of the Greek and Latin Churches,” Cambridge Medieveal History, vol 4: The Eastern Empire, Ed. J.R. Tanner, C. W. Previte-Orton, Z.N. Brooke, pp. 594-626. __________., “The Greek Church: Its Relations with the West up to 1054,” Cambridge Medieval History, vol. 4: The Eastern Empire, pp. 246-273. John T. Creath, “Alter-Bread,” New Schaff-Herzog Encyclopedia of Religious Knowledge, vol. 1, p. 142. P. Drew, “Eucharist,” New Schaff-Herzog Encyclopedia of Religious Knowledge, vol. 4, pp. 195-199. John H. Erickson, “Azymes,” Dictionary of the Middle Ages, vol. 2. Ed. Joseph R. Strayer (Scribner, 1983), pp. 31-32.
of 1054,” St. Vladimir’s Theological Quarterly 14 (1970): 155-176. __________., “Schisms, Eastern-Western Church,” Dictionary of the Middle Ages, vol. 2, pp. 44-47. Everett Ferguson, “Bread,” Encyclopedia of Early Christianity, Second Edition. vol. 1, (Garland, 1999) pp. 191-192. George Galavarius, Bread and the Liturgy (University of Wisconsin, 1970). J. Gill, The Council of Florence (Cambridge, 1961). E. J. Gratsch, “Bread, Liturgical Use of,” New Catholic Encyclopedia, vol. 2, pp. Richard Mayne, “East and West in 1054,” The Cambridge Historical Journal 11(1954): 133-148. Mark Noll, Turning Points: Decisive Moments in the History of Christianity (Baker 1997). Jaroslav Pelikan, The Christian Tradition, A History of the Development of Doctrine, Vol. 3: The Growth of Medieval Theology (600-1300) (University of Chicago, 1978). __________., The Christian Tradition, A History of the Development of Doctrine, vol. 2: The Spirit of Eastern Christendom (600-1700) (University of Chicago, 1974). J. Pohle, “The Blessed Eucharist as a Sacrament,” Catholic Encyclopedia (online www.newadvent.org/acthen/05584a.htm). Steven Reed, “Bread,” Anchor Bible Dictionary, vol. 1, ed. David Noel Freedman (Doubleday, 1992), pp. 777-780. Steven Runciman, The Eastern Schism: A Study of the Papacy and the Eastern Churches During the XIth and XIIth Centuries (Oxford, 1955). R. W. Southern, Western Society and the Church in the Middle Ages (Penguin, 1970). Paul Tschackert, “Ferrara-Florence, Council of,” New Schaff-Herzog Encyclopedia of Religious Knowledge, vol. 4, p. 303. Timothy Ware, Eustratios Argenti: A Study of the Greek Church under Turkish Rule (Oxford, 1964). Reginald Maxwell Wooley, The Bread of the Eucharist (A. R. Mowbray, 1913). This entry was posted on Thursday, May 12th, 2011 at 3:49 am	and is filed under Church, Church History, Lord's Supper, Worship. You can follow any responses to this entry through the RSS 2.0 feed. You can leave a response, or trackback from your own site. Very interesting post. Like you, I was always taught that unleavened bread symbolized the sinless body of Christ. also, that the supper was introduced at a passover meal; and even that passover was celebrated on both Thursday and Friday at that time as there were just too many people in Jerusalem to slaughter that many lambs on Friday alone. Leaven was always symbolic of sin in the scriptures. This gives me something to think about. Randall thanks for reading and commenting. Leaven is not necessarily a negative image in scripture. It is often used positively. Leavened bread is only forbidden in the Passover but allowed in other shalom offerings in the Hebrew Bible. The Greeks interpreted the idea of leaven in the bread in light of the Incarnation of the Word. The leaven was the “soul” of the bread just like Jesus has a real soul (thus the charge of Apollonarianism against the Romans). Delighted to see your contribution here too. First I have studied the Synoptic/John issue and there is lots of material on the subject but I have never actually put pen to paper or fingers to keyboard to express my thoughts. The usual solution is that the Synoptics are using a different calendar than John. This particular suggestion is plausible in light of the Dead Sea Scrolls. As for the other matter. I think it is practically indisputable that artos is in fact plain bread unless indicated to be otherwise. I am convinced, now, that in Corinth the gathered disciples ate plain bread … which also makes sense in light of the fact that the Supper itself took place within the larger context of the Agape Meal. If Jesus did in fact celebrate the Passover (and I think the Greeks are wrong on this) the early church did not feel that the entree on the Table was binding and felt free to adapt to the Greco-Roman culture on this point to use ordinary bread (Paul never calls it unleavened bread in Corinthians). The Greeks seem to be correct on the innovation of the Catholics and the tradition of the church. The Greeks came to believe this use of ordinary bread was binding and invested the symbolism of leavened bread with huge theological weight. That symbolism is powerful indeed. However, I think the shift from unleavened in the historical Last Supper to leavened in Corinth shows that it was a matter of adiaphora. The lesson to be learned is that we often do not realize we are perpetuating deeply held “convictions” that are nothing but the remains of medieval Catholicism. The unleavened bread contributed to the sense of mystery of the mass … but in the early church the Supper was in fact a MEAL!! A celebration (Eucharist) a time of joy, communion with God … AND with each other over bread that is no longer “common” (justin’s words) because of Jesus. This is an interesting post. I think your conclusion is correct. We have sunk our beliefs deep into tradition, but we have stood on them as gospel. Part of the beauty of the Lord’s Supper is its ordinary yet sacramental nature. I wonder if using real bread would help us connect differently with the table. At my congregation, the L. S. is central only in symbol only. The real beauty of communion is that it is the acting out of the gospel, the good news that God is breaking down all walls and gathering us together under Christ’s head. I wonder if the ordinary bread would help us to embrace the sacred and ordinary in the meal. Maybe it could help us to live as Kingdom people. This is WONDERFUL research & wisdom, Bobby! Thank you SO much for being the researcher & scholar you are & for sharing your studies with all of us! Truly! At our annual Thanksgiving (Eucharistic) meal, our Life Group eats a meal together with unleavened and leavened bread. We talk about Jesus and what He has done and is doing in our lives. It would be great if P.V. could do this (maybe break into smaller groups) and communicate while we commune. Thanks for the blog. The bread represents Jesus’ TEACHING. The wine represents that Jesus is the VINE OF DAVID (i.e. the Messiah). This is extremely interesting because it could have some bearing on the confrontation between Peter and Paul in Antioch as Paul describes it in Galatians. Peter stopped “eating with the Gentiles” but why? Could it be because the original symbolism of the Lord’s Supper, the one followed in Jerusalem by Peter, James, and John, was that of the Didache, and that Paul changed the symbolism by incorporating symbolism more familiar to Gentiles? It is well know that 300 years before Christ, the Mithraists were eating a supper of bread and water in which they believed they were eating the body and blood of Mithras. About 500 years before Christ, the worshippers of Attis would kill a bull and eat its raw flesh and drink its hot blood, viewing this as consuming the god Attis himself. The church fathers, Justin Martyr (150 AD) and Tertullian (208 AD) both recognize that these Pagan meals are extremely similar to the Christians’ communion. Could it be that Paul borrowed the symbolism of Attis and Mithras, and imposed it on the Lord’s Supper because he thought it would be more familiar to the Gentiles than the very Jewish symbolism that Jesus actually established? I think it is actually a certainty. Surely it was not Jesus who made the Lord’s Supper a Pagan feast of symbolic cannibalism. Glad to have your comments. Your comments go into a direction that i was not covering however in my blog. Just a couple of my thoughts in response. 1) The Didache is an important early document and I referred to it in my blog post. The material related to the Supper comes from chapter 9. The first prayer, for the cup, thanks God for the Vine which is the descendent of David – Jesus. The prayer for the bread does not refer only to the teaching of Jesus. Rather that prayer thanks God for the “life and knowledge” made known to us through the Son. 2) I do not see any conflict, real or imagined, in the Didache’s language and that of the NT documents themselves. Given the preponderance of Matthean language in the Didache it likely that the words here presuppose the words in Matthew anyway. 3) I dont know any scholar that dates the Didache to AD 50. I have seen some propose a date as early as 70 and as late as 130 but most place it around 100. I think that is probably the most likely date myself. None of those dates makes it earlier than Paul and given the date of 100 that is most likely it is not earlier than any of Gospels. 4) I agree with you that the Lord’s Supper is not a pagan feast in which we literally eat Jesus. I do not think Justin thought that either. But regardless in the NT documents (Gospels & Paul) the interpretation of the bread and the cup is hardly different. Mark preserves the tradition of Peter and his wording of the Supper is not in conflict with Paul’s in 1 Cor. 5) I do not think Peter’s behavior in Antioch is related to a difference in theology of the supper. Thanks for an excellent study regarding the bread. A few years ago I became involved in a study of the Passover and the Supper trying to see how they tied together in symbolism both at the time Jesus established it and how the early church celebrated it. I did not get into the bread controvery on the level that you have done (sure appreciate your study on this!) but I came to some conclussions in my own study that Jesus celebrated the Passover as any Jew would celebrate the Passover and that would exclude leavened bread. I find the suggestion some have made that Jesus would have used leavened bread for the Passover meal or the meal the day before the Passover highly questionable if not some what desparate in their attempt to prove a point either way because of the Jewish Passover practice of removing every bit of leaven from the house several days before having the Passover meal. Some of my resources came from a Jewish Chirstian who was very knowlegable about Jewish customs of the 1st Century, especially the feasts. My study also pointed to leavened bread being used after Pentecost due to its availability as the earliest Christians celebrated the Supper at the main meal each day for a period of time. As the church grew and the everyday celebration during a main meal became once a week celebration during the main meal, unleavened bread would still be common. Part of my study looked at how unleavened bread was made for Passover. There was a very exacting process that was used for it to be used in Passover and that cooking process would have made unleavened bread much harder for the common household to have at every meal. As a result of my own study, I changed my mind on the importance of the unleavened bread in our Sunday celebration (which I used to hold to a more legalistic view of this as unleavened only) and recognized that either can be used. I think that many in the RM do not have enough background in 1st Century Jewish customs and life of the time period and tend to be traditions directed. Nothing wrong with that but it does produce some very hardened practices in the church. I personally prefer the unleavened because of the visual and spiritual symbolism that can be seen in the unleavened bread that Jesus used to tie the past to the present and to the future but would not hesitate to use leavened bread if that was what was offered. Again, thanks for the excellent study. I see more than once in the comments that the communion was part of a fellowship or agape meal during the first century. I wrote that into a facebook status a while back and was blasted and marked by some church of Christ preachers. I was also blocked from being their friend on facebook. I am “assuming” that since this has been stated in this blog that it is perceived to be true. At what point and for what reason then did the communion change from daily with a common meal to a “chip & sip” pushed into a one hour assembly on Sunday? I know of some churches that have members who take communion Sunday morning and Sunday evening while others will condemn you for that. Thank you so much for sharing your study. I found it fascinating. Interestingly, the Churches of Christ church I belonged to used unleavened bread every Sunday; but on Good Friday they used a whole loaf of “normal” leavened bread and we would each pick a piece from it as a special gesture of commemorating Jesus’ sacrifice. Since the Didache has been mentioned a few times: I’m intrigued that Christ’s suffering and crucifixion are not mentioned in connection with the Eucharist in the Didache. It seems to have been be purely a time of thanksgiving. Thank you for sharing this article. Fascinating! Interestingly, the Churches of Christ church I belonged to used unleavened bread every Sunday; but on Good Friday they used a whole loaf of “normal” leavened bread and we would all pick a piece from it as a special gesture of commemorating Jesus’ sacrifice. Thought you might find that interesting as I have not ever heard of this here in the states.